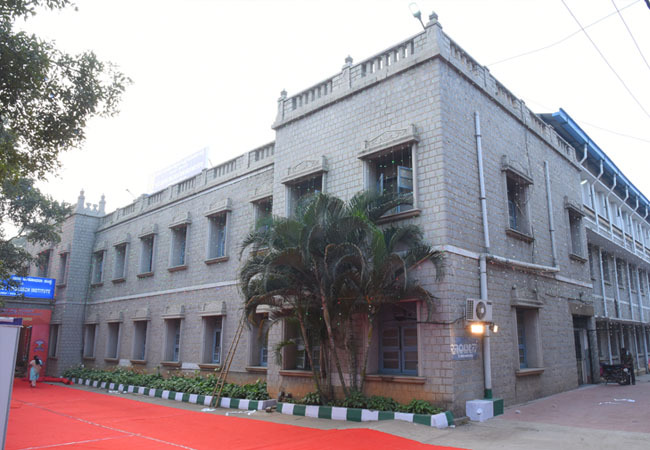 GOVERNMENT DENTAL COLLEGE AND RESEARCH INSTITUTE BANGALORE is a renowned dental Institution and considered to be one of the best in India. Established in the year 1958 by Dr.S. Ramachandra . It offers graduate and post graduate degree courses in dentistry which are approved and recognized by the Dental Council of India. Situated in the heart of the city, the hospital attracts large number of patients and caters to the needs, not only of the affluent but also poor and backward strata of the society. 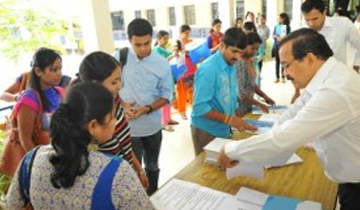 The college and hospital have state of the art infrastructure, excellent & experienced teaching faculty. Greetings from GDCRI Our Alma mater It is heartening to know that our GDC is turning sixty and celebrating its Diamond Jubilee this year. These years have been momentous in our lives. This premier institute has provided all the good things that have enabled us to lead our lives with professional dignity and pride. 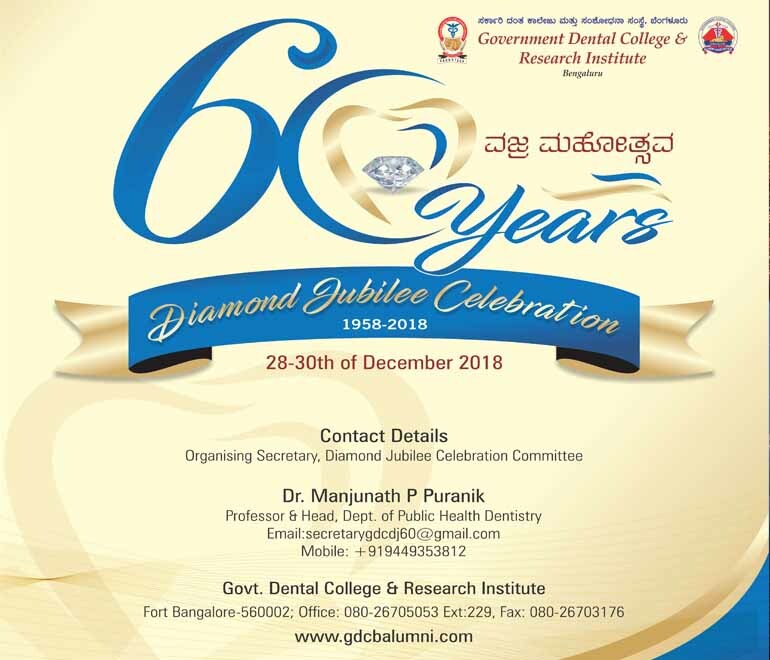 It is time for all of us to come together for one more time on the occasion of Diamond Jubilee of GDC to be celebrated on 28, 29 and 30th December 2018. The Organizing Committee is striving hard to make this great event grand and memorable. Series of lectures, Sports and Cultural programs are being planned for the Diamond Jubilee. Another highlight of this program is the formation of GDC Alumni Benevolence Foundation with the objective of supporting needy students and patients and research. 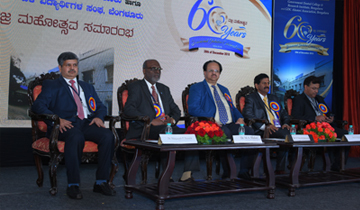 Government Dental College, Bangalore was started in the year 1958. To begin with the Dental college was provided with facilities for an office and lectures. The academy organizes CDE programmes for each dental specialty every month , inviting renowned guest speakers along with the host speakers, attended by staff & students. The institution functions with separate departments for all the subjects with the best possible practical/lab/clinical sections with the best teaching staff. One of the best Dental labs in Bangalore with excellent technical staff, it is renowned among the clinicians for the quality Crown and Bridge work delivered. Quality assurance Cell is one more aspect that plays major role in assuring that our mission objectively met and helps for continuous growth. “Sky is the limit for Education, Learning process never ends,” The academy organizes CDE programmes for each dental specialty every month. Though we are 13 months away from the above" Historic Meet" the Tempo is already building up. We have given this extra time to prepare ourselves in every aspect. We are a topmost Dental College in bangalore. We believe in quality and standard teaching. 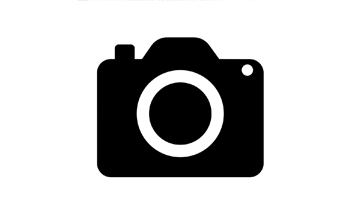 www.gdcbalumni.com © All Rights Reserved - 2019. Designed by Mars Web Solution.